With a stunning fleet of modern, fully-fitted mobile units on the road delivering an unrivalled 24/7 service, McNamee Tyre Services provides commercial vehicle and passenger car owners with tyre (as well as mechanical and servicing) solutions that are simply second to none. We visited the company’s resplendent 7,500 square foot facility in Mullingar and touched base with founder / proprietor JJ McNamee to get an update. For more than a decade, McNamee Tyre Services has been offering superb products and care to commercial vehicle operators and passenger car owners across the midlands and beyond. The spacious facility at Lough Sheever Corporate Park epitomises the cutting edge of tyre retailing in Ireland, while a modern fleet of mobile units ensures that customers receive the utmost attention and care 24 hours a day, seven days a week. Tyres comprise a service-orientated business and owner JJ McNamee leaves no stone unturned in ensuring that each and every one of his customers receives exceptional levels of service –prompt, professional, safe and affordable! With five dedicated car bays to the front, two truck bays to the rear and 30 car parking spaces outside the building, customer convenience is a given and JJ has at his disposal the equipment, tools, personnel and expertise to make sure that all vehicles leaving his premises are running at optimum efficiency and safety, equipped with the best tyres, parts and service available. 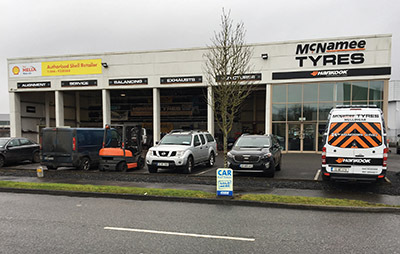 The skill and experience of the diligent, and friendly technicians at McNamee Tyre Services is unsurpassable and a large range of high-quality tyres is stocked, all carrying the E mark and covering all major brands such as Dunlop, Goodyear, Hankook, Michelin, Continental and Bridgestone. If a particular make or size isn’t in stock, it can be sourced and fitted in double-quick time. It’s a delicate juggling act but McNamee Tyre Services manage to offer the most competitive prices across their vast array of tyres whilst never compromising on quality or safety. With 20 years’experience of the tyre trade under his belt, JJ made the decision to go out on his own just over a decade ago. He has never looked back, investing a huge amount of long hours, money and sheer hard work into building up a loyal customer base and an outstanding reputation for excellence. “I set up on my own in late 2005 / early 2006 and opened up in this purpose-built facility in late ’06,”he reflects. It was a brave move –how did he know there would be sufficient demand to sustain the business as a viable commercial enterprise? “I sat in the local coffee shop one day watching the traffic on the street outside - all that rubber passing by and nobody in Mullingar catering for the tyre customer. I decided to just jump ship and go out on my own to provide that service. To be honest, my only regret is that I didn’t do it earlier. “We had a couple of great years before the recession, which arrived at a bad time but we managed to come through that. I’ve grown year on year and have taken on lads gradually and have never had to let anybody go, which is good. Due to the downturn, we decided to diversify and started to do mechanical work, taking on a qualified mechanic who has been with us for eight years now. The tyre repair / replacement operation (incorporating four-wheel laser wheel alignment) is complemented by a range of other services including servicing (all makes and models), safety checks, pre-NCT inspections and NCT corrections, exhausts and batteries, headlight focussing, timing belts, clutches etc. McNamee Tyre Services afford customers the peace of mind of knowing that when they buy a tyre, that they are getting a top-class product at a fair price. To minimise downtime and maximise convenience, customers’vehicles can be picked up at their place of work or home and dropped off if required. 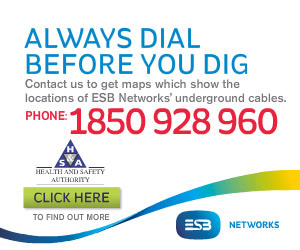 Coverage is provided within one hour of Mullingar, which encompasses a vast catchment area considering McNamee Tyre Services’proximity to major arteries such as the M4, M6 and M50. Generating full-time gainful employment for a team of six, including JJ’s wife Fiona “who does all the hard work behind the scenes”, McNamee Tyre Services is not alone a tremendous success story achieved against considerable odds but also an inherent part of the local community, providing valuable support and sponsorship to many worthy clubs and events, including, for example, the Raharney GAA club’s hurlers. The recession has presented challenges for every business associated with the motor industry and only the strongest have survived. “Things are improving from where they were but we’re still not out the other side of it just yet,”JJ says. “You still have to watch yourself and buy tyres right because the day you buy them is also the day you sell them. It’s those little things that all add up to make a big thing …and the big thing at McNamee Tyre Services is total customer satisfaction.